David Allen is quoted as saying, “You can do anything, but not everything.” In the process of building growth plans for various size businesses, there comes a point where the team begins to put together ideas for the future. Those plans are expressed in terms of goals and action plans to support those goals. Members of the team tend to be optimistic about their future or they would not be invoked in such a planning process. The result is a list of plans and ideas which are far beyond the capacity of the organization to accomplish. At that point, priorities have to be established. As a business leader, there needs to be a decision as to what must be done now and what needs to be done over a longer period of time. Plans that involve the immediate profitability of a company need to be done now. A firm in financial crises needs to do everything it can to increase sales and reduce costs quickly. That is an immediate priority which cannot wait. Sales promotions and downsizing are actions which result from that priority. Plans which are important to the long-term success need to be prioritized using a different methodology. Developing staff, growing talent, or developing a new product is accomplished step-by-step over months and years. Balance in setting priorities is a matter of judgement. An organization in crisis will need to give high priority to the immediate. That is not to say that it doesn’t have any longer-term priorities, but the majority tend to be immediate. A more stable organization has the ability to prioritize a larger number of long-term goals, but can’t forget their day-in and day-out goals. During a planning session, two extremes often develop. The operation and sales people will often tend to develop immediate goals and priorities. In doing this, they need to be careful not to have so many that none will be accomplished. Prioritize a few of the most important and, after accomplishing those, move down the list. Marketing and product development will prioritize items which need to be managed over months and years. When planning these types of goals, it is important to break them down into short range sub goals. If you must develop a goal that will be accomplished in two years, set sub goals which will be accomplished over the next several months which will eventually lead to the accomplishment of the two-year goal. Last year we were working with a firm who, over its history had a good growth rate and developed a reputation for excellent service in its market. Although they were profitable, they were on the verge of realizing exceptional profitability. One day, we received a call from the owner telling us that they had received the opportunity to add a service in a somewhat different area through the acquisition of another small firm. The client had “run the numbers” and saw a major economic gain. This seemed to be a distraction. 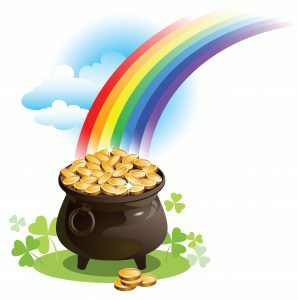 Entrepreneurs and small business people are always looking for that “pot of gold”. It is not like we would discourage anyone from being opportunistic but a venture into a new service was not on the list of current priorities. In this case, the owner had developed a plan to increase its customer base while emphasizing productivity. The decision, after some consideration, was not to be distracted by this potential opportunity. Instead, the owner did not divert from the original priorities and as a result obtained a moderate increase in business with a significant increase in profitability. This resulted from prioritizing sales growth and profitability over the “pot of gold” distraction. 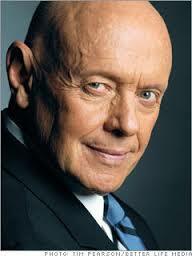 Stephan Covey tells us, “The key is not to prioritize what’s on your schedule, but to schedule your priorities”. What a different perspective on the subject of time management for business leaders. Our schedule often gets cluttered with meeting and other administrative functions. But consider this. If you have a business plan which you believe will lead to greater success and you have prioritized goals within that plan. Why don’t you schedule the accomplishment of those steps within your schedule? For example, if customer loyalty is a prioritized goal, then why don’t you schedule a regular meeting to review client feedback and progress on plans for improvement? We are often asked by clients to help them with Time Management. Our initial work in this area was to help with developing a schedule and working from a “to do list”. This provided some help to individuals, but we concluded that the setting of goals, prioritizing those goals, and developing action plans was the most effective means of organizing the time of business leaders. We have since renamed this process, Time Strategies, to reflect the concentration on prioritization of plans and implementation of those plans within a schedule. 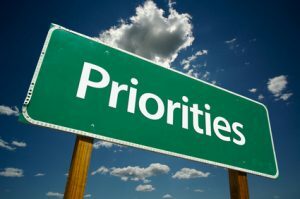 The line between business and personal priorities in today’s 24/7 world is often blurred. We often find business leaders talking about attending a child’s game or spending more time with family. Several people we know prioritize not working on the weekend. They will spend as many hours at work between Monday and Friday to properly execute their responsibilities but never work on the weekend. Always being home for dinner is another commonly heard goal. Much can be said about being more efficient with your time during the regular work day, but it starts with that as a priority. Don’t think it unprofessional to include personal priorities in your personal business plan. RLS Focused Solutions has worked with business and nonprofit leaders over the last 15 years to help them strengthen their individual leadership skills and in turn build their organization. It’about being focused and avoiding distractions. Visit our website at plangoals.com or email bob@plangoals.com.